Frank Tetto says he’s far from perfect, but he’s not a drunk. But that’s not what you’d think if you read the discharge papers he received after a stay at Saint Clare’s Dover in December 2013. Tetto, 67, said his wife suspected he was jaundiced, so the pair went to the emergency room at St. Clare’s Dover. “Besides a few cursory questions about my general health, the treating doctor’s questions focused on drinking. How much I drank, how often I drank, what happened when I stopped drinking,” Tetto said. He said he and his wife repeatedly told the doctor he didn’t have a drinking problem, he said. He did occasionally have a drink in social settings, and during the past three months, he drank one or two glasses of red wine daily as part of an overall strategy to improve his health, he said. Once he was admitted, Tetto said, he gave no further thought to the questions in reference to alcohol. During his hospital stay, doctors told Tetto that he probably had pancreatic cancer. The diagnosis was confirmed at another hospital a few weeks later. Tetto said he had no beef with the diagnosis, but with his discharge papers from Saint Clare’s. “My discharge papers from the hospital read ‘alcohol abuse induced jaundice,'” Tetto said. But that wasn’t right, Tetto said. “The medical tests revealed my jaundice was caused not by alcohol abuse but by pancreatic cancer,” Tetto said. While it’s true that he told doctors he had a glass or two of wine each day, Tetto took issue with the word “admits.” He said the doctor’s notes made it sound like he’s a drunk rather than someone who just answered the doctor’s questions. Tetto has gotten through difficult times in his life without alcohol. He’s spent the last 17 years as the primary caregiver for his daughter, who sustained a serious brain injury when she was struck by a vehicle in 1998. The “alcohol abuse” label hit Tetto hard, so he contacted the hospital to ask for a correction. Saint Clare’s sent him the paperwork, which Tetto promptly completed. On Jan. 15, 2014, the hospital made a change. The change to “episodic drinking” was even worse than the first diagnosis because the hospital decided to “double down on the alcohol abuse error by claiming I was a binge drinker,” Tetto said. While the phrase “binge drinker” wasn’t in the report, definitions of “episodic drinker” overlap with “binge drinker.” It’s defined as five or more drinks at one sitting for a male, and four for a female, according to the National Institutes of Health. And that wasn’t near the level of alcohol consumption Tetto reported to the hospital, he said. “It was not accurate but also… it was disparaging of my character,” Tetto said. He also said he feared that if the wrong information was shared with other medical providers, it could negatively impact his future treatment. He said he contacted the hospital several more times to ask for further corrections, but was told repeatedly that no further changes would be made. So Tetto turned to an attorney. The attorney, William Ware, wrote a letter to Saint Clare’s on Feb. 12, 2014, saying the change was not acceptable. The hospital still refused to remove the alcohol references, Ware said. Ware said he had a theory about why mentioned of alcohol were prevalent in the document. The belief is not uncommon. A 2011 study by the American Cancer Society found those who reported drinking three or more liquor drinks a day saw their risk of dying of pancreatic cancer go up by about 36 percent compared to nondrinkers. The study found no risk increase for those who drank beer or wine. Over the next several months, Ware said, the hospital wouldn’t budge. 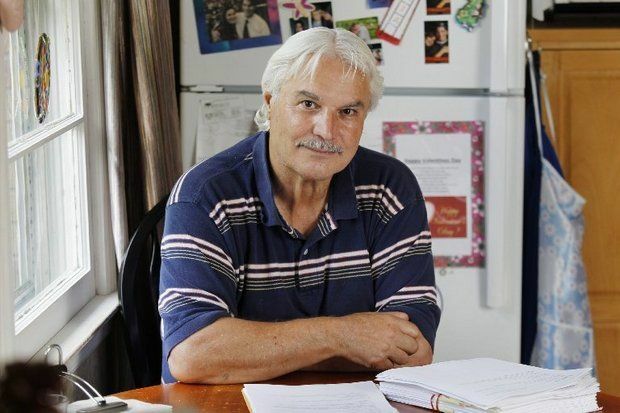 It didn’t even help when in June 2014, three of Tetto’s treating physicians wrote notes stating they believed Tetto’s jaundice had nothing to do with alcohol, nor did his pancreatic cancer, and they said he never abused alcohol. Around that same time, Ware recommended Tetto use another attorney with more expertise in the area. Attorney Robert Correale picked up the fight, contacting the hospital several times in writing and on the telephone. In the fall of 2014, there was a victory. Saint Clare’s agreed to remove all references to alcohol in Tetto’s records, in essence “cleansing” his file. be reimbursed for his $7,000 in legal fees. So attorney Correale made the request, but the hospital said no. To Tetto, this wasn’t just about his reputation, but about right and wrong, so he asked the attorney to try again. And again, the hospital said no. Bamboozled reviewed Tetto’s hospital and doctor’s records, and letters and emails between the hospital and Tetto’s attorneys. We then reached to Saint Clare’s, asking it to take another look at the case. The hospital said it worked closely with Mr. Tetto and his designated representatives, saying medical care providers rely on information provided by both patients and family members to render accurate diagnosis and treatment. But hang on. Tetto did, from the start, try to work directly with Saint Clare’s. He asked to have the records corrected through the hospital’s own procedures. It refused, at least until two attorneys took up the case. We asked the hospital about that, but it didn’t really answer the question. It said it regrets that Tetto felt he couldn’t resolve the problem directly with the hospital, and said patients can contact Saint Clare’s directly at (973) 989-3189 to resolve any concern. Tetto’s not done yet. Even as he’s fighting pancreatic cancer, he’s considering a fight against the hospital in court, and he’s looking for an attorney to represent him.